FACT CHECK: Could a Case Currently Before the Supreme Court Result in a Stronger Presidential Pardon? Could a Case Currently Before the Supreme Court Result in a Stronger Presidential Pardon? Gamble v. United States concerns a felon who was arrested for possession of a firearm. It could also have significant bearing on the President’s much vaunted pardon power. Judge Kavanaugh, if confirmed to the Supreme Court, could be a deciding vote on a case that has the potential to dramatically increase the power of the presidential pardon. On 29 November 2015, a motorist named Terance Gamble, who had been convicted of second degree robbery seven years earlier, was pulled over by an Alabama police officer because of a faulty headlight on his vehicle. Upon searching the car, the officer found a handgun, among other items. It is illegal under both Alabama law and United States law for convicted felons to possess firearms, and Gamble was eventually sentenced to one year in prison on that charge by the state of Alabama. Gamble has been in federal prison since entering a guilty plea on 18 October 2016 that allowed him to appeal his case. In June 2018, the Supreme Court agreed to hear his argument that he has been unconstitutionally punished multiple times for the same crime. While the case is about the constitutionality of a man being charged twice for the same gun possession incident in a narrow sense, the case more broadly has the potential to significantly alter 150 years of Supreme Court precedent. We have here two sovereignties, deriving power from different sources, capable of dealing with the same subject matter within the same territory. Each may, without interference by the other, enact laws to secure prohibition, with the limitation that no legislation can give validity to acts prohibited by the amendment. Each government, in determining what shall be an offense against its peace and dignity, is exercising its own sovereignty, not that of the other. How Can a Case Overturn a Precedent? The separate sovereigns exemption has for much of its history been a controversial precedent which critics maintain is not rooted in the original text of the Constitution but is instead cobbled together from different partially relevant Supreme Court decisions — decisions rooted in a time when the federal government was less powerful and whose questions never directly sought to address the explicit matter of double punishment for the same crime in state and federal jurisdictions. This argument is reflected in Gamble’s filing. Each sovereign is entitled to “exercis[e] its own sovereignty” to “determin[e] what shall be an offense against its peace and dignity” and prosecute the offender “without interference by the other.” Under petitioner’s interpretation of the Double Jeopardy Clause, one sovereign’s efforts (successful or not) to enforce its own laws would vitiate the other sovereign’s similar law-enforcement prerogatives. But that cannot be squared with the Constitution’s bedrock structure of governance. Why Would President Trump Be Interested in the Outcome of This Case? 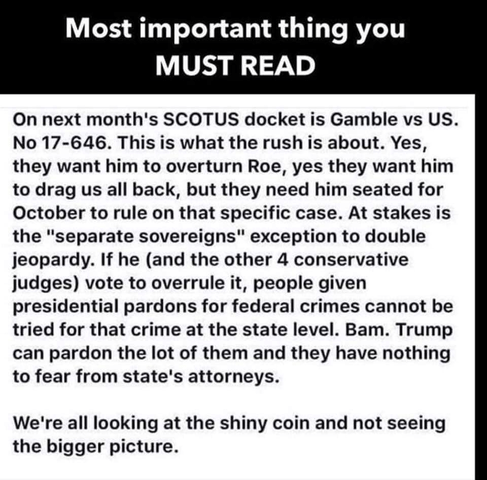 The Gamble case may nevertheless have significant collateral legal effects … A win for Gamble could also indirectly strengthen the President’s pardon power, by precluding a state from prosecuting an already-pardoned defendant who has gone to trial on an overlapping offense. What Does This Have to Do with Brett Kavanaugh? Within the context of the Mueller probe, legal observers have seen the dual-sovereignty doctrine as a check on President Donald Trump’s power: It could discourage him from trying to shut down the Mueller investigation or pardon anyone caught up in the probe, because the pardon wouldn’t be applied to state charges. Under settled law, if Trump were to pardon his former campaign chairman Paul Manafort, for example — he was convicted in federal court on eight counts of tax and bank fraud — both New York and Virginia state prosecutors could still charge him for any crimes that violated their respective laws … If the dual-sovereignty doctrine were tossed … then Trump’s pardon could theoretically protect Manafort from state action. If Trump were to shut down the investigation or pardon his associates, “the escape hatch, then, is for cases to be farmed out or picked up by state-level attorneys general, who cannot be shut down by Trump and who generally — but with some existing limits –can charge state crimes even after a federal pardon,” explained Elie Honig, a former assistant U.S. attorney in New Jersey. Oral arguments for the case have not been scheduled but will occur during this Supreme Court term. If confirmed, Judge Kavanaugh could become a deciding vote in the case. Yale Law Journal. November 2014. Congressional Research Service. 16 August 2018.